Eataly is an energetic marketplace with restaurants, an opportunity to taste and take home the best Italian products of artisans who bring you the highest quality products at a fair price. 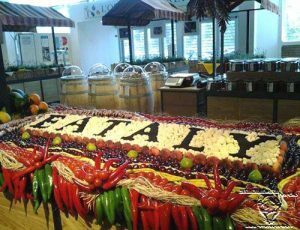 Eataly is the heartbeat of Italy. Here you can meet the best chefs who cook products coming from every Italian region. Their purpose is to show that quality products are not accessible only to a select few. THE MARKET AT EATALY is open every day. Their signs will give you the story behind every product they sell and serve, illuminating the vignettes that make Italian food culture so full of personality and warmth! Good eating and shopping is an agricultural act we all have the right to enjoy. Eataly, believes that what you choose every day determines what we’ll stock on our shelves over time. When you demand quality products, you support the local farmers, fishermen, butchers, bakers, and cheesemakers who produce them and create a better environment—for eating and beyond. Eat Better, Live Better Today. 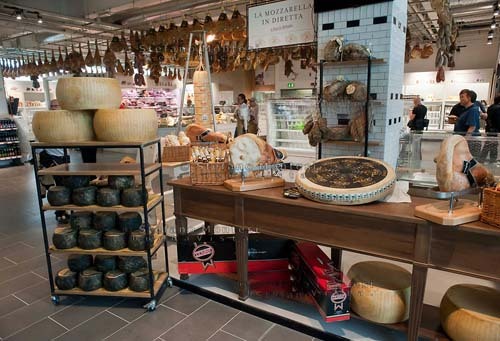 It’s easy to Eat at Eataly because They Cook What They Sell In Store. In fact, restaurants use the highest quality ingredients from the market like prime meat, salumi, cheese, fish, vegetables and more to produce dishes that focus on simplicity. Hopping from restaurant to restaurant in our vibrant marketplace, it is an experience you’ll never forget !!! Experience our Italian product, EXPERIENCE ITALY !